Many of us use constraints which impost a date on finish or start of an activity/milestone especially on major event (i.e. equipment delivery date, subcontractor’s foundation completion date, contract award date, project completion date, etc. ) in schedule as Primavera P6 schedule date might be changing whenever we schedule. And it is not feasible to readjust those date changes again and again. In some cases, we might use hard constraints (e.g. Mandatory Finish) to monitor the dead line date as soft constraints (e.g. Start on or After, Finish on or After, etc.) don’t hold the dead line date. But! There might be a problem when hard constraint (inflexible constraint) is used in the schedule. According to PMI, Practical Standard for Schedule, “Date constraints restrict a project’s natural flow, disregard the effects of risk, and limit the usefulness of schedule risk analysis. Date constraints should be avoided whenever possible and used only when compatible with a project’s expected course of development. When a date constraint becomes necessary, flexible constraints are preferred over inflexible constraints”. Schedule constraints especially hard constraints make it difficult to determine the longest path or near longest path as CPM calculation doesn't override this kind of constraint. That means it make Complete Longest Path invisible. See the following scenarios. In both scenarios, the Complete Longest Path is not visible due to the use of hard constraint. The longest path is broken. Add another milestone which has a hard constraint as hanging milestone without having successor. Do not impost any constraint on existing milestone. As an existing activity/milestone is not imposed by a constraint date, it makes a Complete Longest Path visible in both situations. At the mean time we are able to monitor a dead line with a hanging milestone. See the following situations. 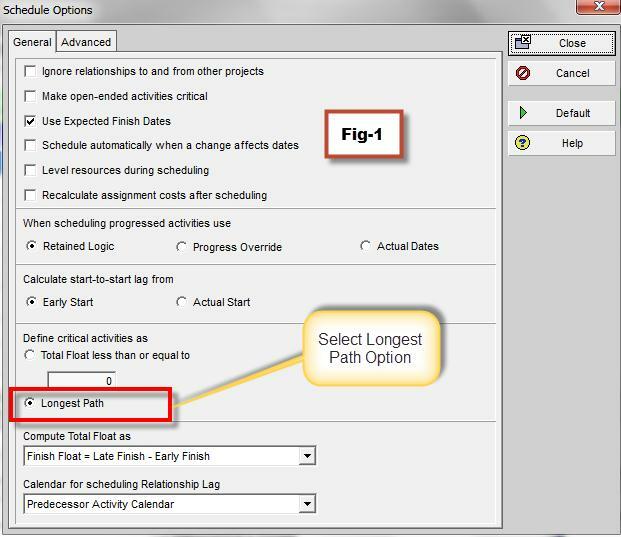 Select the Longest Path Scheduling Option in order to determine the critical path as longest path. How to change the scheduling option in P6?? Select Longest Path Option under General Tag. See in Fig-1.